3900 pounds; tongue weight 170 pounds; Rated for towing at 65 mph; Hydraulic surge and parking brakes. Work Platform is 4' x 2'6"
Outrigger footprint is 12'4" long x 11'4" wide;Power source is 24 volt battery with 245 Amp/h. 20'9" up and over height. 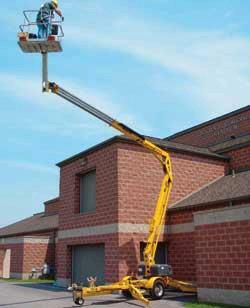 * Please call us for any questions on our lift boom art towable 45 foot rentals in Tualatin and Eugene, serving the Portland Metro area, Eugene/Springfield Metro area, Oregon, and SW Washington.